DENVER — There are plenty of ways to get around Denver. Public transportation, biking and walking are among the most popular. Each comes with its own set of challenges. 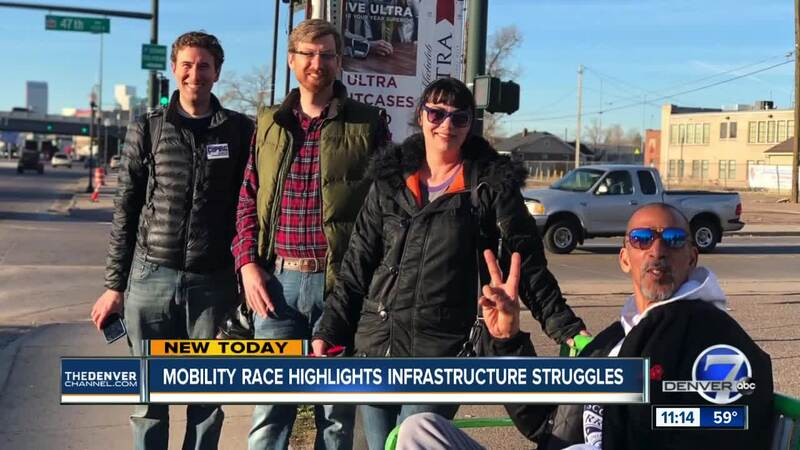 Thanks to the Amazing Denver Mobility Race on Thursday, 15 candidates running for local office in Denver got a first-hand look at some of the issues people see every day during their daily commutes. The event is hosted by Denver Streets Partnership. The catch? The racers weren't allowed to use a car. "We wanted this to be an educational experience for everyone," said Danny Katz with the Denver Streets Partnership. Teams started from four different locations around downtown Denver. Their final destination was the intersection of 15th Avenue and Wynkoop Street near Union Station. Racers were asked to document the good and the bad of their trip in regards to transportation and infrastructure on social media using #Denmobilityrace. Despite a few setbacks, like missing their first bus, Katz's team won the race and then reported on what they experienced. "It's a lot easier than you might think, and the comfort level of the vehicles, the bus and the train," said one racer. Another participant brought up the issue of closed sidewalks along the way and how it made it more difficult to cross the street to catch the train. What was all-in-all a fun race finished with a serious purpose. "Everybody that I have seen running for office this spring is talking about transportation and talking about growth," Katz said. "This race gave them a chance to put themselves in the shoes of Denver residents who use bikes and take public transit all the time."